(November 30, 2014) The Charlotte Douglas International Airport is updating its 1996 Noise Exposure Map for 2015 and creating a 2020 map for the future. The first set of Noise Exposure public meetings was held in late July for airport neighbors to gain information about the process and methodology, to ask questions, and to share their opinions. More than 250 airport neighbors attended. 6 PM - 8 PM Thursday, December 4 at Olympic High School, 4301 Sandy Porter Road, Charlotte, NC 28273. Preliminary draft contours will be on display, as well as several informational graphic boards in an open house style setting. A 30-minute presentation will begin around 6:30 PM. The open house session will occur from 6:00 PM to 8:00 PM. During that time, attendees will be encouraged to ask questions of airport staff and of land use and noise consultants, who will be in attendance before and after the presentation. 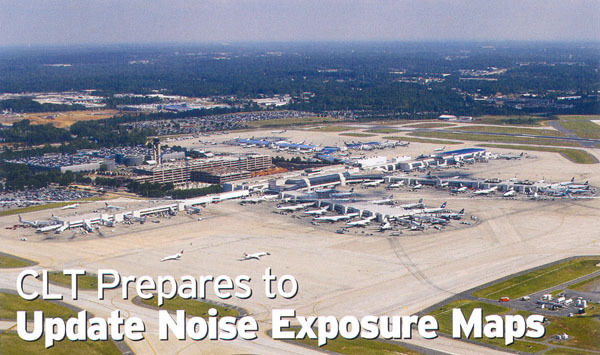 To submit a comment or question regarding the noise Exposure Map update, email clt-nem@landrum-brown.com. For more information see Noise Exposure Map Upate Meetings. 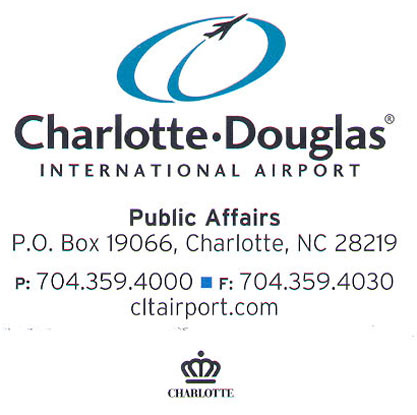 Please direct questions to the Charlotte Douglas International Airport Public Affairs Office at 704-359-4000.